It's Now Easier Than Ever Before to Be Proactive in Your Shop! Manage screen printing, embroidery, signs, banners, promotional items, and more all with a single program. Get Started with Great T-Quoter Features. Do Accounts Receivable, integrate with QuickBooks, create Purchase Orders, Schedule Jobs, Know your Costs and more - all with industry specific software that will help you gain more control over what is going on in your shop, helping you to become more efficient and profitable. It makes running a screen printing and embroidery shop fun again! 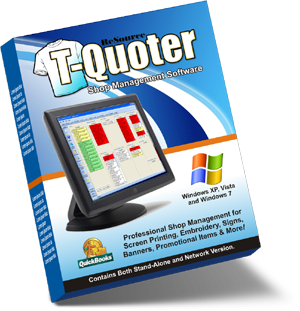 There are 2 ways to purchase T-Quoter. Either way you purchase, you can add additional licenses at any time.